The Ridgeland Police Department’s mission is to provide police services in order to enhance community safety, protect life and property, and reduce crime and the fear of crime. The department works with the community to improve the safety and quality of life in our city by identifying and resolving public safety concerns. The Police Department exists to achieve a safer community for the citizens of Ridgeland by providing excellent public safety services and involving our community as partners. Ridgeland’s officers and staff value integrity, innovation, leadership, respect, service, education, accountability and teamwork. 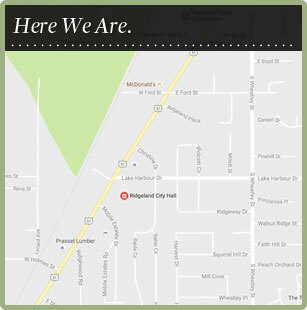 Community policing is one of many strategies utilized by the Ridgeland Police Department to achieve a safer community. Innovative methods and technology are used to enhance communication and performance as well as to coordinate with neighboring local governments for improved safety. The Ridgeland Police Department is accredited with the Mississippi Law Enforcement Accreditation Commission. The police department is required to demonstrate compliance with 123 professional standards in order to become accredited. An assessment team reviewed the department’s policies and practices, interviewed personnel and closely examined files. Comments from department employees and members of the community were also taken during the assessment. Accreditation standards cover topics such as use of force, training, disciplinary procedures, selection process, promotions, career development, patrol, criminal investigation, pursuits and traffic. Adherence to accreditation standards prompts a police department to strengthen its crime prevention and control capabilities, establish written procedures for essential management functions, maintain fair personnel practices, improve delivery of police services, solidify inter-agency cooperation and coordination, and to boost citizen and staff confidence in the department.